Feline Distemper Vaccine protects against a combination of highly contagious viruses that can cause respiratory and GI disease. These serious diseases can affect cats of all ages and can be a threat to your cat even if your cat stays indoors! Feline Panleukopenia (AKA "feline distemper" or "cat parvo")- is a virus that is spread by contact with an infected cat's saliva, urine, blood, nasal discharge, or feces. There is no cure for panleukopenia and, without treatment, it has a high mortality rate. Symptoms include: appetite loss, lethargy, vomiting, and diarrhea (possibly containing blood). Infected cats need aggressive treatment as this disease can be rapidly fatal. 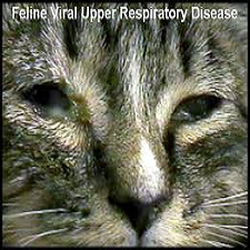 Feline herpesvirus (AKA "feline viral rhinotracheitis") is a virus that attacks the upper respiratory tract resulting in symptoms including: sneezing, clear to pus-like discharge from the eyes and/or nose, coughing, lethargy, fever, appetite loss, and eye ulcerations. This virus is very contagious and spreads through infected saliva and nasal discharge or contact with contaminated objects like food bowls. Even cats that appear to recover from their symptoms may remain chronic carriers for the rest of their lives and can infect other cats. Feline calicivirus also affects the respiratory system, similar to feline herpesvirus, but infected cats may also develop painful ulcerations in their mouth. Calicivirus infected cats may also become chronic carriers.